A favourite picture of yourself with friends or family is always nice to hang on the wall, but if you’re looking for some new ideas for your home, we’ve got some tips for you! Take a look at the six ideas below and create a wow-effect with your wall decor! Step outside the box with your next family photo. 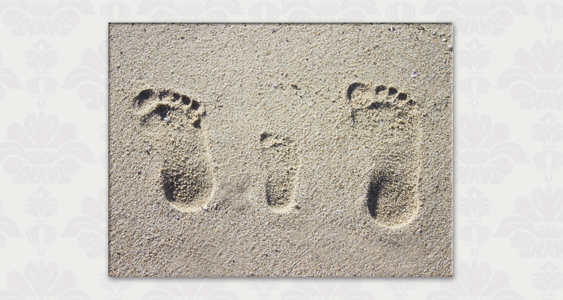 A picture like the one above is timeless and shows off your family’s creative side. And the best part? No one has to worry about a bad hair day! 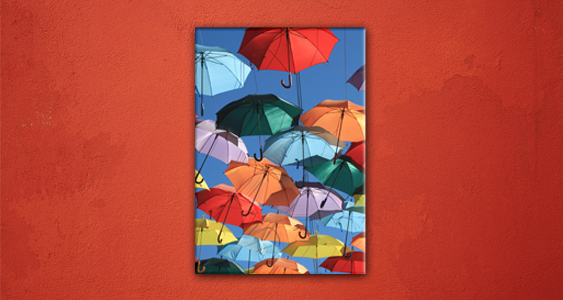 Try this on a canvas to add a rich, warm look to your walls. Get more photo ideas like this one with our holiday photography tips. Look around you and find the colour in your life. Add colour to your home with pictures of flowers, colourful Moroccan spices, bright umbrellas and anything else that catches your eye. For an abstract look, shoot close-ups and try out different angles. Print your photo on acrylic to really make the colours pop! Make a close-up of a piece of heritage before it moves to the trash and create vintage art! Do you have an old heirloom, like a rug or sofa, that you never want to give up? 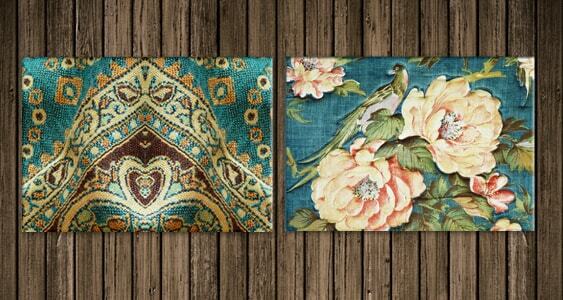 Make a beautiful photo of it and hang it on your wall as vintage art! For the complete vintage look and feel, print your photo on canvas – the rough material will bring out the original texture of your treasured antique. A simple image can have a big impact. At first glance this photo may not seem very interesting (after all, it’s just two chairs in a corner!) but an image like this can have a very soothing effect. To bring tranquility into your interior, capture the symmetry in your life on a canvas, acrylic or aluminium print. Photograph a clock and make time stand still. Now days everyone has the time on their phone and no one needs a clock on the wall, but that doesn’t mean you can’t still use clocks to decorate your home! 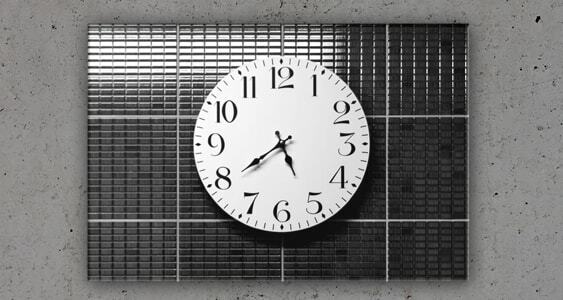 For a creative take on time, photograph your favourite clock in black and white and print it on aluminium. You’ll have a nostalgic piece of art in no time! A new twist on a classic still life. 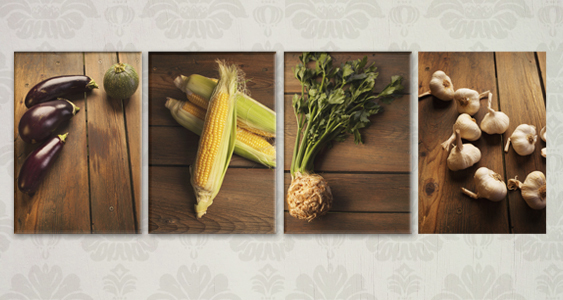 Take photos of fresh foods and create your very own modern-day Rembrandt! 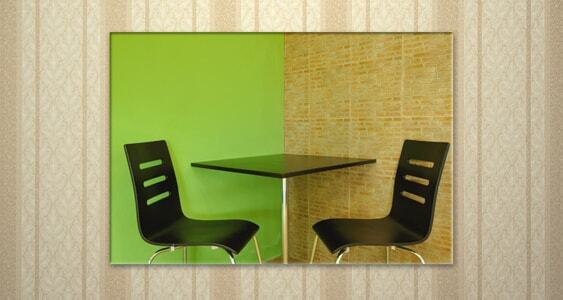 Print your photos on four small acrylics and spice up your kitchen with a photo composite. Want more food photography inspiration? Check out our example cook book. Feeling inspired? Create a canvas, acrylic or aluminium print now.